Looking for Outdoor Portable Fire Pits? We will look at the small metal fire pits and discuss the properties. This will give you a better idea of what will work for you. We will be looking at the wood burners in this article. Most metal fire pits are made of cast iron with some having a bronze or copper finish.The bronze or copper will make them last longer in the outside environment. Most of the time only the bowl part of the pit will have a coating on it. The legs and frame will be made of cast iron or stainless steel. The size of the bowl will be how much wood that you can burn at one time. The deeper and wider the bowl the more wood it will take. Also the taller bowls can have sculptures on the side. Some will have collegiate logos for tailgating. If you like to cook on your pit, look for one that has a grate that you can put a cook pot on. Most grates will not be able to handle a hamburger as it will fall into the fire. Your fire pit can come with many extras. Look for the ember cover. This will keep your fire from spreading out in your yard if you have to step away from it for a few minutes. Most will come with a poker that doubles as a lift for your cover. Look at the different models as most will come with a vinyl cover. This will help your pit weather the rain and snow. If it is not included, this is a great upgrade for you to make your pit last longer. Because this will be an open fire, you must keep your fire pit 20 feet from the side of the any structure. This will keep you from melting any vinyl siding or catching any wood on fire. Do not use any flammable starter for your fire. This will include Gas, Kerosene, Alcohol or other flammable liquids. Use small sticks or starter wood pieces. Do not use on composite or wooden decks without a Deck Mat. These mats will protect you surface, but you will still have to be away from any structure that the fire could harm. Adult supervision is necessary when children are around the fire pit. When making S'mores or hot dogs Adults must make sure children are following all safety rules for an open fire. 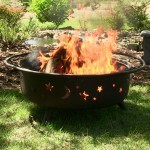 Here are several items that can make your outdoor fire pit a great addition to your outdoor space. Log Grabber-will make getting and moving bigger logs easier. It can handle logs up to 8 inches around. Deck Mat-Available in several sizes, this mat will protect your deck from the heat of your fire pit. It will not protect the side of any structure. Log Rack and Cover-Small log racks can store you wood close to your fire area so that you do not have to transport it a long way to your fire. The cover can protect your logs from weather and let you have a fire at any time. Firewood Log Cart-If you have an existing storage are for your logs and it is a long way to your fire pit area, the log mover will help you navigate almost any terrain between the two. Click here for more information on the Firewood Log Cart. Most small fire pits a portable enough to take any where. Some are made with a carry case to pack up and put in the trunk of the car. Comes with every thing except the wood to burn. Easy to assemble. Most can be put together in less than a half hour. Must be kept out of the weather or covered to protect it from rust. Most do not have room for cook pot or cooking. Must purchase a grate with legs to use for cook pots. 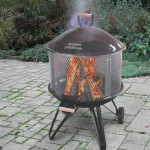 If you have a need for heat or a portable cooking appliance, the Outdoor Portable Fire Pits will work for you. If you have any questions or comments please use the form below and I will get back to you. Thanks for the comments Shirley. Just trying to get people to get the correct item the first time. Just trying to get the correct information out. Lots to know about safety. Nice article and love your site. We recently purchased a fire pit and are enjoying it so much! Great information to know when you have them! Safety is very important in any thing that involves fire. What do you think of chimineas? (Not sure I have that spelled right, but I’m talking about the outdoor clay fireplaces from Mexico) I have found them to act like huge radiators when the clay gets warm. The Chimineas are a good choice for wood heat. I will look into this for you. I know that the clay ones are hard to ship because they are fragile and heavy.